﻿So we are in the full swing of Summer folks, and its beyond hot and humid. As of late, all we can seem to bear is light fare. Colorful and fresh veggies have been on our must have list, especially avocados. You name the meal, we have included avocados in every way this season! From guacamole, to sandwiches, to chicken salad....woah!? Chicken salad you say? Umm yeah. That's right. 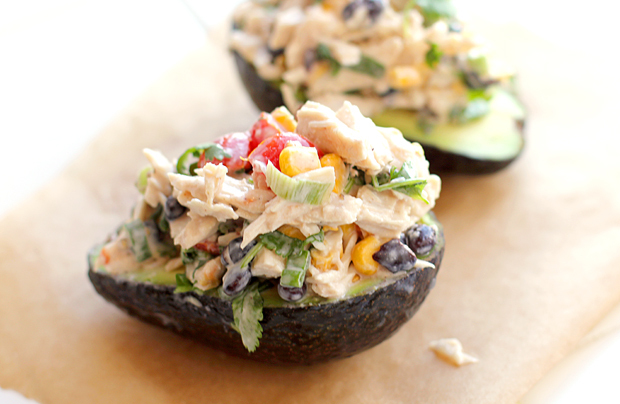 We have the most amazing creamy avocado chicken salad recipe to share with you. Eat seconds...after all its full of veggies. Right? Nom, nom, nom. In a medium bowl, toss the chicken breast, corn, black beans, green onions, tomatoes, cilantro, and corn chips together. Add the vinegar and mayonnaise to mixture and toss to coat. Salt to taste. Spoon salad into halved avocados. Serve immediately with a spoon and fork. Enjoy! Oooh yum! Thanks for sharing - I have to make this! Pretty presentation too! WOW This looks soooooo good! Yum, I am printing it out as we speak, what a great and beautiful idea for a summer luncheon! Saving this for my menu plan next week! I am on an avocado kick right now and this looks delicious. Happy weekend. This is amazing!! PERFECT summer recipe!! I may just have to cube up some fresh mango to go in/with this ;) Thanks for sharing!! !